We closed up the tent Friday night after a sluggish opening reception at Art City Austin. The crowds were thin and I had only sold one print. "There's two days left," I reasoned, "things will pick up." Storms had been forecasted for that evening but so far not much had happened. A neighboring artist came by and showed me his weather app. "Look, the storms are going both to the North and South of us, maybe 10 mph winds for Austin tonight." I felt a wave of relief. A couple hours later I was lying in bed listening to the wind outside. It was certainly gusting more than 10 mph. I said a prayer and drifted into an uneasy sleep. Upon waking the next morning I checked my phone. An email from the art fair coordinator read, "Storm at Palmer Event Center. 60 mph winds. 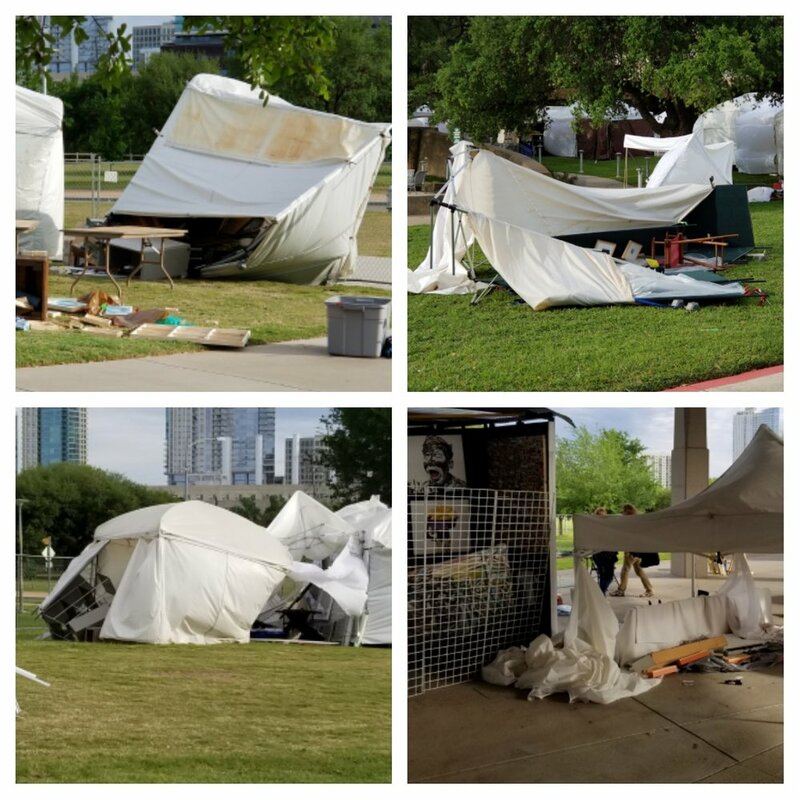 Updates on booths that were damaged..."
We made our way to the event center. Walking in from the parking garage we saw some damaged tents, and felt a great deal for these artists. It's not easy doing shows. Our tent wasn't visible yet. The sidewalk was blocked by another 10 ft x 20 ft tent that had been thrown 30 feet. We rounded the corner to find our tent blown about 3 ft off place. "It's still there, standing," I thought to myself. What would be inside? The walls were at funny angles and had come unhooked from their corners. Miraculously not a single piece had fallen to the ground. In the center, "Struggling Sailor, Sleeping Sailor," stood sure, unbuffeted, a reminder of who is in control as told in Mark 4. As one of the fortunate ones we were able to carry on with the show. Which turned out to be a good thing. 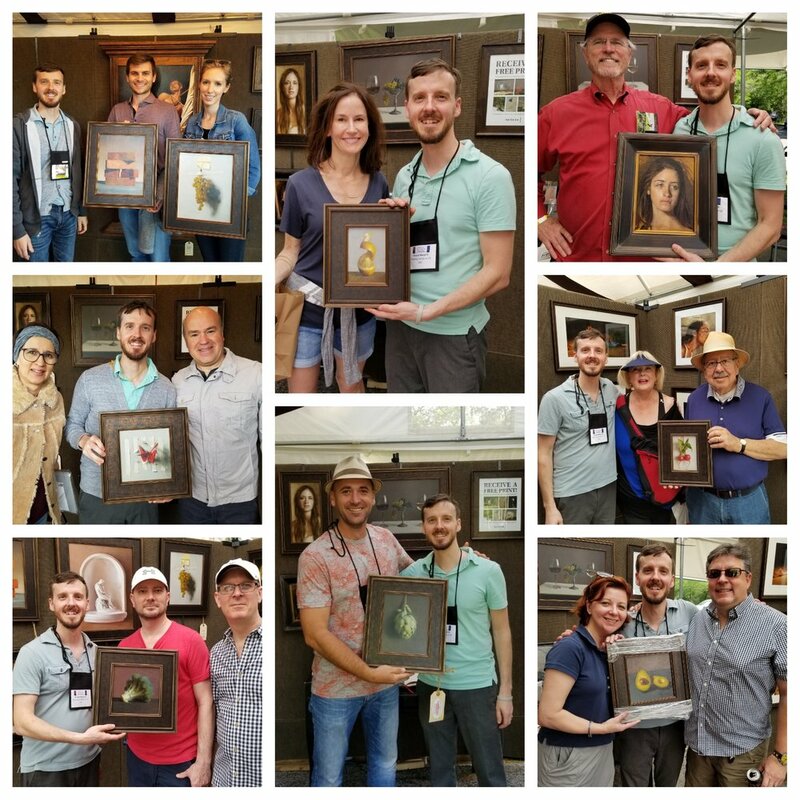 Here's all the pieces that went home during our entire Texas trip! Three stayed in Austin, the rest in Houston. Congratulations on your paintings everyone! I'm honored and humbled and grateful for each of you! Grab your 1981 Montgomery Ward suitcoat and go! My mother has kept a few treasures back from when I was a lad and now Ernest IV gets to wear them. He was running around church and I just couldn't stop laughing by the shocked looks he was getting. The coat radiates an otherworldly, intense red and were I to paint it, I'd be going directly for my cadmium red light. Of course, my darling Mira was participating in her first Easter and wearing a dress. This is probably the most effort we've made in dressing our children in months. The new work will be posted this week on Patreon. If you'd like to see what appears out of the painting ether, it's the best way to keep in touch! Go there now.